In the mid-1990s, when I pulled an old short story titled “The Immortal Game” out of a drawer with the intention of turning it into a novel, I was heavily influenced in mood, setting, and even details of plot by a San Francisco guidebook. That volume was no ordinary Frommer’s guide. It was Don Herron’s The Dashiell Hammett Tour, which was published at that time by City Lights. From the book I learned where Dashiell Hammett lived when he wrote The Maltese Falcon (at 891 Post Street)--and decided to place my fictional detective in the same apartment. I learned the building and exact office where Hammett worked as a Pinkerton detective--and likewise put my protagonist in the same building. Finally, I discovered that Hammett spent a great deal of time reading at the old main library, and decided to have my detective research a key clue there. None of these Hammett “Easter eggs” was explained in my novel, but I had a lot of fun putting them in for Hammett aficionados to find, and it made me feel somehow closer to the great writer and the American hard-boiled fiction tradition. Now, after it’s been out of print for almost 20 years, Vince Emery has brought Herron’s guidebook back as part of his publishing house’s Ace Performer Collection, which features books by and about Dashiell Hammett. The full title of the revised and expanded, 224-page edition--which officially goes on sale today--is The Dashiell Hammett Tour: Thirtieth Anniversary Guidebook ($19.95). The 30th anniversary mentioned in the subtitle refers to the number of years since Herron’s guidebook was first brought into print. Herron has been conducting his famous Dashiell Hammett walking tour since 1977, following the route he traces in this book’s eight maps, and relating the Hammett facts, anecdotes, and arcana that he describes so well in these pages. Although I’ve only met Herron briefly at various Hammett-related events, I suspect that reading the 30th anniversary edition of this book is like taking in a highlights reel of all the great conversations he has had over the three-decade life of his four-hour tour. For not only do you get a guide to all the known Hammett residences and many of the San Francisco locations mentioned or implied in The Maltese Falcon and other Hammett fiction, but you are also given an excellent pocket biography of Sam Spade’s creator, lots of interesting back story on the investigations undertaken by Herron (left), Fritz Leiber, Bill Arney, and Joe Gores to locate San Francisco’s Hammett heritage sites--including a discussion of the present-day controversy that still surrounds a few of those selections--and a heartfelt introduction by the novelist’s surviving daughter, Jo Hammett, that grounds the whole book. Yes, she tells you in effect, you are really reading about my father and the life that he and I led in San Francisco in the 1920s. The new, Ace Performer edition features a number of excellent photographs, both modern-day and contemporary to Hammett’s time. In addition, there’s an introduction contributed by the late Charles Willeford and there are several great new anecdotes about Hammett commemorative events that took place in San Francisco since the publication of the last edition. My favorite is Herron’s description of the “Walk of Fame” that was planned for the sidewalk in front the Union Square Hotel, the place where Hammett’s soon-to-be wife, Josephine Dolan, stayed on the night before they were married. The plan, in April 1995, was to inaugurate the walk with impressions of the hands and feet of Hammett “dignitaries,” including Jo Hammett and Elisha Cook Jr., the actor who played Wilmer in John Huston’s film version of The Maltese Falcon. I won’t give away the whole story, but let’s just say that there was a problem with the concrete, to say nothing of Cook. Another feature of this book I very much appreciate is the annotated bibliography of Hammett articles and books at the end. I didn’t agree with all of Herron’s opinions about the materials, but if you were looking for a concise starting point for Hammett research--or simply some compelling biographical reading--it would be hard to do better. As with all of the books in the Ace Performer Collection, The Dashiell Hammett Tour is handsome and lushly produced, which is particularly appreciated in a guidebook featuring so many photographs, maps, illustrations, and street indices. And the 30th anniversary edition marks the first time Herron’s book has appeared in hardcover. If you are a Hammett fan, this work belongs on your bookshelf, even if you have a previous edition. If you’ve not read Hammett, then you should pick up a copy of The Maltese Falcon and Don Herron’s book and follow along. 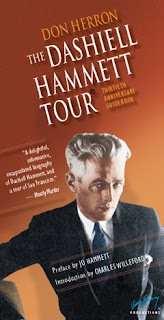 The Dashiell Hammett Tour is the treasure map to Sam Spade’s adventure with the black bird. READ MORE: “Forgotten Books: Don Herron’s Dashiell Hammett Tour Guide,” by Evan Lewis (Davy Crockett’s Almanack). I've taken the tour with Don several times, and I've loved it. 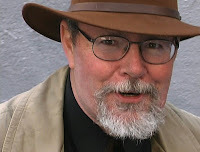 Don just wrote an article on San Francisco Mysteries for our San Francisco Mysteries issue of Mystery Readers Journal.